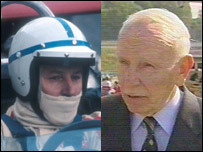 Former world champion John Surtees has announced plans to open what is thought to be the UK's first ever motor racing academy. Surtees - the only man to win the world title in a car and in a motorbike - co-owns the Buckmore Park circuit in Kent where it will be based. Some of the biggest names in the sport were at the track on Wednesday for the launch of the scheme. It will attempt to unearth a new generation of champions to succeed the likes of James Hunt, Nigel Mansell and Damon Hill. Buckmore Park, near Rochester, specialises in karting, the form of motor racing which started the careers of grand prix greats such as Ayrton Senna and Michael Schumacher. 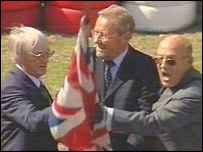 Surtees said he hopes the scheme can help bring more British youngsters into the sport, and they can then go on to greatness in the more glamorous versions of motor racing, such as Formula One. He said: "Karting is the very grass roots of motor sport. "What I would like to see is a wider opportunity given to youngsters to participate in an exciting learning programme. "There may be another Michael Schumacher or Valentino Rossi out there as for too long we have not had a British world champion driver or rider. "The important thing is to have dreams - we've done this in football, we've done it in cricket and they don't produce the sort of revenue that motorsport does." He unveiled the plans for the training and technology centre, which will also look to produce top engineers and team managers, with Formula One supremo Bernie Ecclestone. Mr Ecclestone said: "The talent will show and will come out obviously, but unless you're exposed somewhere who's going to find you? "It's nice to see that John has done this and made the effort and been so enthusiastic." The centre will cost £3m to complete as outlined by Mr Surtees and his supporters- but with the UK motor racing industry having an annual turnover of about £5bn, he hopes the industry and the government will be able to help with funding.